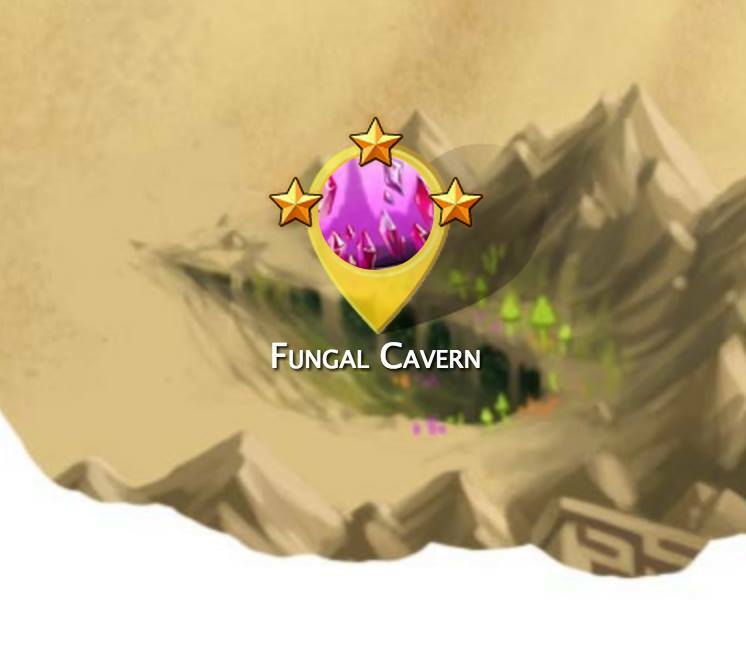 Welcome to the Fungal Caverns page! As I find out information about this new area, I will be posting it here! Please leave comments if you discover something that I’ve missed! Map Piece Required: Purchasable in the Muridae Market cartographer for 230,000 gold (as of right now). New Traps: Crystal Crucible Forgotten Trap – 7,800 Power, 10% Power Bonus, & 8 Luck. Also takes a healthy mixture of other loot items to buy it. Here is a screenshot of the new HUD once you enter the first time. This is the first “location” in the Fungal Cavern. Operating similarly to how the King’s Gauntlet operates, the opening of the Cavern is where you’ll find the Fungal Fodder mice. When hunting here, you’ll need a strong HYDRO trap to maximize your catch rate. Which trap should you use? Ideally, you’d tackle this area with the Swarm of Sharks. If you don’t have that trap yet, the Phantasmic Oasis Trap (and it’s Chrome version of course) or the Rune Shark will work, though not as well as SoS. A Forgotten trap will work in the first tier, though with less effectiveness than a Hydro trap. For your base, just use your luckiest base you have. That might be the Fissure Base. It might be some random LE base that I rarely ever mention in the walkthroughs anyway. Regardless, use your best and luckiest base. For cheese, I have found that simple brie is just fine for attracting the Fungal Fodder mice, though you can use gouda as well. Super Brie is necessary to attract the Nightshade Masquerade Mouse (the only mouse that drops both sets of loot). How much you collect and how much you need might be two different stories. If you’re playing on a browser, you can mouse-over the hud and look at the recipe for Glowing Gruyere Cheese. You need a 3:1 fungus compared to nightshade ratio, as well as three living shards and handfuls of curds and salt. Magic Essence increases the yield, as expected. Some people began moving on with 100 pieces of Glowing Gruyere, while others stockpiled considerably more before moving on. The answer is never easy. I personally waited until I silver crowned 8 of the first 12 mice before moving on. I had over 1300 pieces of GG cheese when I finally moved on. This was before we had an substantial analytics on the area. I built a calculator based on Horntracker data. It is in a very early Alpha stage and not ready for mass consumption yet (only my team has access at the moment). Needless to say, we’ll talk more in the next section of the details, but if your goal is to buy the Crystal Crucible trap after one run, you should shoot for 3 pieces of Diamond Cheese to give yourself a good and decent shot at getting the loot you need. I will break down all the numbers in the next section. This section isn’t more complicated than the first, but the mice are tougher to catch. You won’t be getting the same loot as tier 1, this time you’ll be collecting minerals. And you’ll need a lot of them, because minerals are used in all three cheeses you’ll craft for tiers 3 – 5. First, let’s talk about your trap options. Hydro will still work to some degree, but it’s not the best option. You’ll want to use your best FORGOTTEN trap now. Ah yes, I do realize that if you’re at this part of the game and have not had the opportunity to obtain an event-specific forgotten trap, your time here will be much more complicated (read: longer). The good news is, most people reading this now have some sort of LE or event-related Forgotten trap. And the better news: the Forgotten Art of Dancing trap is NOT a limited edition trap and was purchasable in March of 2015 at the birthday event after being the reward in March of 2014 (and it was cheap, less than 200,000 gold). It’s a safe assumption to conclude it will return again in March of 2016 and beyond. All that being said, it’s best to use a Forgotten Trap now with your Glowing Gruyere cheese. And collect those minerals. Craft Mineral Cheese, but not too much! Wait, what? Don’t craft too much? That’s right, don’t get carried away with using all your minerals crafting mineral cheese. You still need it to craft both Gemstone and Diamond cheese, and of course, set aside 800 for the new trap. As you can see, you’re going to need a lot of minerals to turn into a fairly paltry amount of future cheeses. When in tier 2, you’re only focused on collecting minerals and thus crafting mineral cheese, but create too much and you’ll have none left over for the other two. From what I have experienced in hunting here, each piece of Glowing Gruyere cheese will yield about 4.2 minerals. Not literally, of course, this is an average over time. So, what do you actually need in terms of minerals? At a 0.3 diamonds dropped per gemstone cheese usage, you need 100 gemstones (or 102, which is an even “3” number). To get those 100 gemstones, again at a 0.3 gemstone drop rate per mineral cheese usage, you’re going to need 333 pieces of mineral cheese. [Clears throat] 3,367 minerals needed without magic essence, 2,700 with it. So let’s back up. Are you hunting with this much cheese to start with? If not, move back to Tier 1 and get some more. Now you need to craft your mineral cheese. You’re probably not at the exact formula above, but please use it as a guide. If you are following it, you’re going to use 1333 of your minerals to craft cheese now (with no magic essence). Your job is tougher now, but the process is the same. You may want to think about using some powerful charms at this point, like ancient or super cactus. They will give you a much-welcomed bonus and make some of these mice not as tough. Remember that only Forgotten setups will capture mice here. Now you’re looting gemstones. You can buy gemstone boost charms off the market (or in the shop for minerals), and they add an additional gemstone to your inventory when you loot one, and the charm is only used up when you actually loot a gemstone. It’s a nice bonus but the charms can be pricy. Following the info above, you will probably end up with around 100 or so pieces of gemstone cheese. Regardless, make sure you keep 800 for your trap and 300 for Diamond cheese. Mice are getting tougher now, but keep plugging away with your best Forgotten trap (luckiest). You’re now after diamonds. Again, following the information from above, you should be able to loot upwards of 30 Diamonds. Not much to add here honestly, same advice for Tier 4 as I had for Tier 3. This entire area is similar to the King’s Gauntlet, with the added “bonus” that you could fail. Fun times! Can i add you as a fellow mousehunter in my friend list? Absolutely! Just send me a F/R, be sure to say it’s for Mousehunt. May I ask if you have test the SOS on Tier 2 area?? can it be stronger than the cup cake golem?? I have not used the SOS in tier 2, I only used the TRex and then the Crystal Crucible once I could buy it. That being said, using the MH Reference 8.11.2 Catch Rate tool, SOS is slightly better overall on Tier 2 when compared to the Golem, though the Shattered Obsidian and Splintered Stone Sentry will still be slightly easier to catch with the Golem. At tier 3 and 4, I was pretty consistent in using either Airship or Ancient charms, though I don’t know how many of those you have. I think maybe aiming for 3 diamond cheese is a little overpreparing. Rather id farm all the gg ingredients in tier 1 because for t1 there is no difference in whether or not you have the upgraded forgotten trap. In all following tiers (t2 upwards) it should make a difference, especially for abt users. So maybe its better to only hunt as much as you need to get 1 diamond cheese at a time. That being said i went almost with my suggested approach… ULC for my two pieces of diamond cheese aaaaaand ftc -.-” both times… almost ready for the third assault. Now I have an ultimate charm. Will tackle it after the sunken city event is over. Wish me luck, please! what is the catch rate of diamondhide mouse? done 3 runs and yet there’s this one mouse that doesn’t seems to be attracted at all. Any special strategies? or just patience? I’ve attracted him three times though. Just a tough mouse. Patience is all I can advise here. I’m not actively working on it now though – working on silvering the Croissant Mouse! Is there any way to speed up garnering of nightshades for tier 1? Using Super Brie will help somewhat as it will attract the Nightshade Masquerade mouse. There are also charms in the shop that will allow for a second nightshade drop, but they are consumed on every hunt, so their use is limited (unlike the gemstone and diamond charms that are only consumed when you obtain loot). It can be a long, tedious hunting experience. I silvered almost all tier 1 mice before even moving on. Silver crowns eh…welp, i guess i have to spend about a few weeks at the tier 1…. What charms did you use with your diamond cheese to catch the crystal behemoth mouse? That’s a great point – I may have mistakenly not added that into my calculation. I’ll have to go back and look. Thank you very much Sue for pointing this out! are you going to add these anytime? and i’ve spent at least 2-3 months at tier 1 and stocked up 1.8k of GG cheese without knowing it. haha..